Would it be cynical to interpret the conference's call to revive the nuclear power sector as hardsell? No. The present is as opportune a moment as can be. And for two sets of reasons. For one, 70 per cent of the world's 442 nuclear reactors will have turned utterly geriatric by 2010, ripe for decommissioning. Secondly, the sector is just not able to corner a bigger share of the power generation pie. In 2002, all reactors, with a combined capacity of 360 Gigawatt-electrical (GWe), provided just 16 per cent of the world's electricity. Not only has this percentage remained the same since 1987 -- the best proof of stagnation (of course, public dislike for its growth is equally important here) -- IAEA dolefully says that total installed power capacity in 2015 will be just about 10 GWe more. Scientists predict that by 2030 the 400-odd lifetime-extended reactors would have to be replaced by new ones to avoid a huge electricity shortage. In Europe, countries with new nuclear power production capacities won't help much. "From this year we need at least four reactors every year to increase capacity. Is this realistic?" asked Ronald Steur of IAEA's nuclear power technology development section. Add to this the sorry state of nuclear proliferation -- locked in a China shop with a US bull, but also a cause to go nuclear carpetbagging: although IAEA's membership is 130, only 30 have nuclear reactors. At the same time, there are countries that wish to keep jogging on the nuclear path. Then there are those who want to join them. And there are companies trying to convince other countries about the joys of jogging. Developed countries that turned nuclear years ago are keeping the sector alive by extending old reactor lifetimes. This is cost-effective and a necessity because the public there wouldn't allow new ones. What has fuelled this process further is 'energy security'. USA's Nuclear Regulatory Commission has approved upgrades of 96 reactors since 1977; some of them by 20 per cent. Switzerland has increased the capacity of its five reactors by 12.3 per cent. Japan plans to extend plant lifetimes by up to 70 years. In 2000, Russia extended the lifetime of its 12 oldest reactors from their original 30 years to a further 15. Spain is spending US $50 million on the Almarez nuclear plant to boost its capacity by more than 5 per cent. Finland has raised its Olkiluoto plant's capacity by 23 per cent. 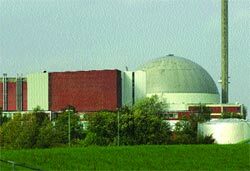 In May 2004, the Swiss rejected a plan to phase out reactors by referendum. The Swedish government's plan to phase out all its 11 nuclear reactors is facing other hurdles too. After closing Barseback I reactor in 1999, the government wants to shut Barseback II but has to prove how it will compensate for electricity loss. After talks with power utilities failed, government negotiator Bo Bylund announced on May 11, 2004 that Barseback II wasn't included in the overall phase out plan. Belgium's phase out plan gives its seven reactors a 40-year lifetime, and allows them to keep working if the country faces power shortage. Finland's new nuclear plant will be ready in 2005. Of the 10 states that joined the EU this year, the Czech Republic, the Slovak Republic, Slovenia, Hungary and Lithuania operate 19 largely Russia-designed reactors. They are being given extensions or replaced with new plants. As governments seek energy security, 'nuclear energy' has become an insistent note -- at the conference this was sweet music to many -- in policy and vision documents. According to USA's Nuclear Power 2010 initiative, the government and private companies will work together to explore sites for new nuclear plants. The first new plant built under this initiative, announced last year and granted US $38 million by the US government, will be ready by this decade's end. The EU's November 2000 Green Paper on Energy Security has recommended a wider acceptance for nuclear energy, as Europe's dependence on imported energy sources could rise to 70 per cent in 20-30 years. According to Brussels-based European Atomic Forum president Eduardo Gonzalez Gomez, by 2007 -- the second phase of EU enlargement -- 15 of the 27 member states will be nuclear powers. "Beginning 2010, it will be necessary for Europe to increase its nuclear electricity production to maintain supplies," says Gomez. "With the development of the European Pressurised Reactor, and Finland adopting it, a new era has emerged. I can see a global market of 400 reactors in the next three decades," says J Bouchard, chief of the France Atomic Energy Commission.